The Best Android Travel App Is Hopper! How flight search app Hopper provides an enhanced service that has caused it to win a Google award and a commendation from Apple and leading media. An app competing in the already highly competitive travel pricing arena has scooped two significant recommendations and awards recently as tech giants Google and Apple have commended it for its innovation and design. 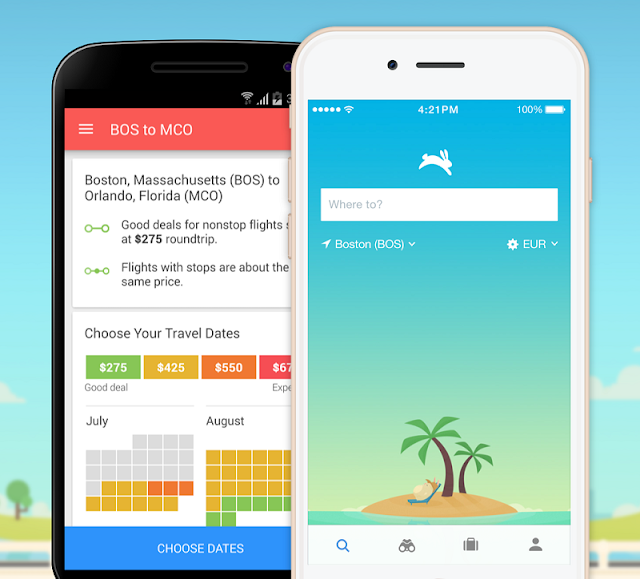 The Hopper app helps users find the best flights deals possible. Flight aggregators aren’t new of course; leading online travel company Expedia offer one and Cheap Flights have for some time been a go to resource for those searching for the best deal. Hopper’s unique benefit is in the way it gives users the chance to either book a flight immediately or wait until the price reduces. Apps such as Hopper, other travel aggregator websites such as hotel and car hire bookers, and along with online travel insurance, make the whole ‘do it yourself’ booking cycle very simple for those looking to put together their own trip rather than booking a package. You tap your destination in to the app and it returns dates when your flight is available, and colour coding shows you which dates are in certain price ranges. You can then ‘tweak’ this to select flights on the dates you want. Hopper will then search for flight prices and then tell you whether you should book now or to wait as the price will likely reduce. If you choose to wait, the app will notify you periodically as to the price status of the flights you’ve inputted. The app guides you as you choose your dates; it’ll notify you if, say, a better option is available in terms of direct flights or similar. Once you’ve decided to book, you can do so easily and swiftly as the app will pass you on to the provider with a couple of taps. If booking with American Airlines, users can do so via the app as Hopper has signed a partnership deal with the USA carrier. The company claim Hopper is accurate with its flight details to within 95%, and when Apple named it one of their best apps of 2015 it was the only travel app to make the list. The company is young, having only launched in early 2015, so picking up Apple’s commendation was a significant achievement particularly in view of the welter of travel apps available, and Hopper currently rides high in the download charts being the top travel app in over 30 countries. As of the end of March 2016 the app had been downloaded over 3 million times and had monitored over 5 million flights. Some 38 million push notifications had been sent to users by this time. With a round of funding secured in early spring of 2016, the company - with staff based in Boston and Montreal - had raised some $38 million as of the end of March. Along with Google and Apple, Hopper has been named as a top app by well-known media such as Vogue, New York Times, Buzzfeed, Tech Insider and TIME. The people behind Hopper aren’t resting on their laurels; various enhancements are planned for the app mostly designed to offer users a more personalised experience. For example, it will be possible to specify certain criteria for flights such as avoiding long layovers, restricting searches to omit low cost carriers, and suggestions of alternative airports amongst other innovations planned. The company also intend to make their already impressive search accuracy even better as development techniques improve. Laura Reeve is the Marketing Executive at Avanti.co.uk, who specialise in online travel insurance for those with pre-existing medical conditions, and are one of very few that have no upper age limit on their policies.